I recently saw a photograph that kind of blew my mind. It was a photograph of Planet Earth from six billion kilometers away (nearly 4 billion miles), taken by the Voyager spacecraft. Launched over 30 years ago to explore the outer planets of our solar system, Voyager is still the farthest and fastest moving man-made object ever. As of 2011, it’s already about 18 billion kilometers away from us, and still moving over 60,000 kilometers per hour. 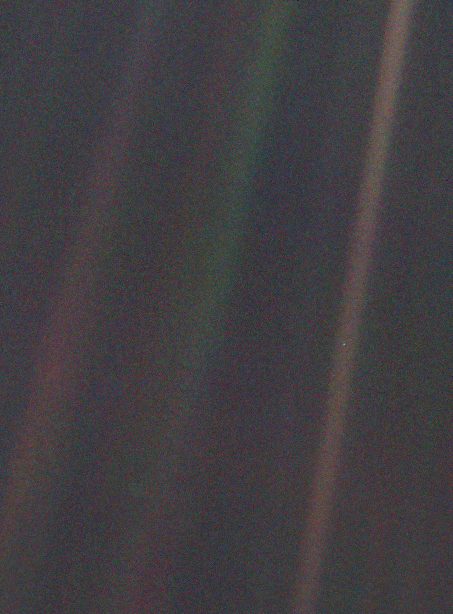 The photo is known as the Pale Blue Dot because that’s how our world appears from six billion kilometers away. It’s so far away that the radio signals took almost six hours to reach us. Can you find it on the picture? Everything we know or have experienced in the physical world is located there, floating in the great emptiness of the space that surrounds us. Everyone you have ever loved, hated, or ignored. Every meal you have ever eaten, every glass of water, every iPod, iPad, used ink cartridge, junked car, every house you’ve ever lived in, is still on the pale blue dot. Where else could you find it? All the material that makes up the planet, and everything on it – all the heavier elements that make up our bodies, the food we eat, the cars we drive, the buildings we live and work in, all of the natural world and the built world – all of this material was forged in the cores of long-dead stars. When the stars died and collapsed and threw their contents across the vastness of space, some of this material condensed around the sun and formed planets, including our own. Moby wasn’t just talking in metaphor when he titled his song We Are All Made Of Stars. He was literally correct. All the atoms of our bodies are billions of years old, formed from the corpses of dead stars that exploded and threw their contents across the vast, still emptiness of space. Sometimes we get so caught up in the closeness of our troubles and day to day worries – we take so many different things personally, even when they are not intended that way. But none of these things mattered four billion years ago, when the sun was born, and none of them are going to matter four billion years from now. What things can you let go of worrying about right now? What can you stop taking personally? What can you stop taking too seriously? When you expand your perspective to the size scale and time scale of the entire universe, a lot of things recede in importance. Only the big picture remains. Glad this article was helpful for you KB! It’s been a long time – how are things going?